In parenting in general I have always tried to avoid using the words "I will never". I figured eventually I would most likely become a hypocrite because how could I say "never" when the whole experience was something I had never taken part in and therefore knew nothing about to make such a hefty accusation. I knew in the back of my mind how I wanted certain things to play out, but then life happens and you just never know what choices you thought you would "never" choose. The opposite has been the case when it comes to specific anti-seizure medications. Once you get thrown into the world of seizures and spasms, and various drug names you quickly get a clever idea of the drugs that you would not want to spill on the floor due to the hazards much less put into your child's body. From the beginning Sam and I were adamant "we would never" give Sonzee the drug Clobozam, also known as Onfi. It is a "big gun" anti-epileptic medication, known as a sedative and classified as a controlled substance. The warnings for this drug are printed in bold on Onfi's very own website. I find that we are at an impossible crossroads. I cannot in good faith let my child seize multiple times a day for 10+ minutes each time. She cannot keep sleeping and seizing. On the other hand, our only choice is a drug that could literally kill her with respiratory issues and/or make her sleep all day long. As usual the question of "quality of life" presents itself in a more pronounced manner. She does not have much quality these days with her seizing schedule. We are at the point where we must take the chance. We must play Russian roulette with our 2-year-old and we must pray we will not regret going back on our never. Oldest: "Ema can I play with Sonzee in my room?" Me: "Yes, just be careful when you push her in the chair not to get her wires tangled"
Oldest: "Come on choupers, let's go"
Oldest coming to me: "Ema, Sonzee is having a seizure, why does she always have a seizure when she is having fun? I was reading her a book and she was smiling and all happy and then she had a seizure again...it's not fair"
Our oldest was just 5 years old when Sonzee was born. An innocent, light brown haired, blue eyed, loving, caring, full of personality, dancing, playing around, typical big sister who has always loved to dote on her siblings and had to learn at the age of 5 what a seizure looked like in a newborn baby. At 5 years old, she was wise beyond her years, but still a bit too young to fully understand or grasp all of what CDKL5 meant for her youngest sister. Sam and I have tried over the past 2.5 years as hard as possible to protect her little mind and heart, answer her questions, give her only necessary information, and essentially trying our best to support her innocence a little longer. However, our little girl is becoming older, smarter, and now at the age of 7.5 she understands more, hears more, knows more, feels more, and hurts more. I am not quite sure what hurts me most about Sonzee's seizures during her sibling playtime, the list is so long. I hate that it disrupts a happy moment occurring between them all. I hate that she has seizures in general and they occur so often that this conversation happens at least once a day. I hate that our oldest must experience at 7.5 what I do now at 33. I hate the sound of defeat our oldest has in terms of her play session being cut short due to the seizure "because Sonzee was having so much fun". I hate that my only answer is "I know it stinks you guys were all having so much fun". I hate that our 7.5-year-old rebuttals with "why does it ALWAYS have to happen". I wish my reply could include more substance than "I don't know, it is such a bummer". It ALL hurts. It ALL breaks my heart. The silver lining comes at the end of the seizure, when I relocate Sonzee to her bed to rest and her oldest sister asks if she can finish reading to her in her room. 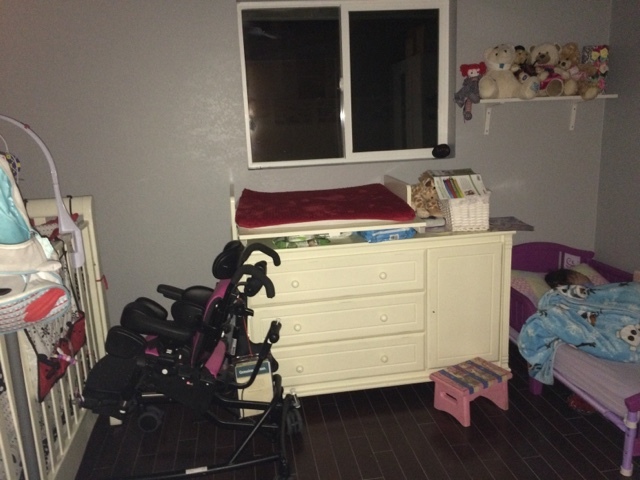 Our oldest and I have one of our typical sevenager disagreements because she wants to show Sonzee the pictures and cannot reach her crib, and I assure her it is ok, Sonzee will just listen because she is too tired at this point to look at the pictures anyway. I leave the room to two sisters, the 7.5-year-old reading to the 2.5-year-old and can almost for a split second forget the events that preceded and the fact that one of them has intractable epilepsy. I will replay the events in my mind and will pray that tomorrow's playtime will go differently, but first I will memorize this image...because this gives cushion to the pain. This love that our oldest has for her "twin-girl" is something that brings tears to my eyes. She has her own twin size bed, with a memory foam mattress (that I personally think is extremely comfortable), but instead insists on sleeping on a toddler bed in Sonzee's room. This brings me a wave of comfort even if it is just a ripple. It has been four days since our CDKL5 family lost another precious little soul. A sweet 2 year 10-month-old little boy who was just 4 months older than Sonzee. The pain is a mixture of heartbreak for his family tinged with fear for my own. Within those four days another CDKL5 2-year-old learned how to take her first independent steps. My heart filled with joy for all she has accomplished and immense amount of hope for her journey, but simultaneously breaks for what Sonzee might never do. My heart and mind both torn at the fact that I should be less selfish about my feelings toward other CDKL5 children’s' advancements and just be grateful it's not my turn to be planning a funeral. This incurable disorder is just devastating on every imaginable level possible. The spectrum is so wide and confusing. We all want to grasp onto hope with the term representing various parts. We hope our children do not constantly seize, we hope our children gain milestones, we hope our children are happy, we hope our children do not suffer, we hope our children do not catch a common cold that sends them into the hospital and has them clinging onto their lives, and most importantly we hope and pray our time to bury our child does not come today. I spend every moment trying to keep Sonzee's life expectancy in perspective. I try not to focus on the "what if" and "when". I do not let those aspects consume my life, but the thoughts are never distant from my mind. I know plenty will say "I shouldn't think that way", even other parents of children with CDKL5, but I will not convince myself otherwise when I know how unforgiving these toddler years can be, when I have witnessed Sonzee teeter on the delicate rope between life and death, and when I watch her seizures increase in both length and intensity right before my eyes. It works the same with her Sonzee-stone achievements, I try not to focus on the "what if" and "When" but just let her do what her body is capable of, trying to truly believe when I say that I am content with where she is at. Daily we have new CDKL5 family members added to our group. Having your child affected by a disorder with such a spectrum is cruel and unfair. A parent posts a picture a picture of their 14-month-old standing and some say it "gives them hope", while I do my best to not compare an apple to an orange. No one wants to have their child "more severely impacted", but someone must fill those shoes. It is just the luck of the draw when it comes to CDKL5 and the role it plays and while we could not have won a bigger jackpot having Sonzee as part of our family, we could not have fathomed how difficult and painful her journey was going to be. We are spending this week at Hershey Park. We've done this before when Sonzee was a year younger, and I could justify her constant position of being in a stroller because she actually was "a baby". It didn't phase me that she wasn't going on the "no infant in arms" rides because she was an infant. She wasn't impressed last year with the few rides she could go on, the merry go round, train, and the monarail, but we took her on them irregardless because I insisted we treat her like everyone else. Fast forward a year, knowing her personality better, and respecting her desires and we decided to not even attempt to take her out of her wheelchair. Sam and I have a routine of waiting in line with the kids to go on rides and then he takes on the children who want to go that have met the height requirements one at a time. It's not ideal but we are clearly outnumbered by children so it is what is, and we don't factor Sonzee "as the reason" we wait. With my parents here this year it makes it easier, but due to various ride restrictions Sam is the sole adult participant for this trip. There are some rides the kids wanted to go on but that would involve taking Sonzee out of her wheelchair and having her be held in my arms and to be honest would result in a miserable time for everyone in addition to her, so we told the big kids we would take them later because Sonzee would be retiring to the room early. As my oldest repeatedly said "even though we love her, sometimes it is just easier to not have Sonzee." "It is easier", after I agreed with her and said the words, the tears swelled in my eyes (thank you $5 sunglasses from Marshalls for hiding this small fact) and I had to choke back the feeling of crying from my chest. It is a honest truth that certain aspects of our life are "easier" without one of our children, and that is the worst feeling in the world and utterly breaks my heart. I can't believe I have to say those words much less think them, and I really can't even fathom that it is actually a fact. It doesn't phase her siblings that we tell them on multiple occasions "we can't because of Sonzee". They don't have tantrums or get visibly upset over the "excuse". They are very "go with the flow" type of children, but I am sure it must be frustrating to constantly hear us tell them they can't because of Sonzee. It warmed my heart to hear my oldest say "we love Sonzee but", but I dislike immensely that there is even a "but" to follow. She isn't wrong either, it is easier at times without their sister, I just wish that wasn't the case.